Groton, NY (March 26, 2019) – Shortly after 7:00 a.m. on Tuesday, March 26th, New York State Police were dispatched to the scene of a collision between two cars and a manure spreader. The serious crash was reported to have happened along Route 222 near Salt Road. According to authorities, 41-year-old Jill R. Ashley Williams had been heading east down Route 222 when she struck the manure spreader from behind. 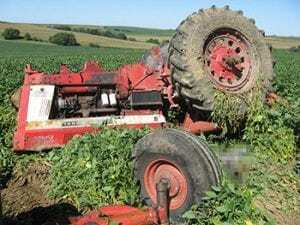 The spreader was being pulled by a John Deer tractor, operated by 23-year-old Walter Vasquez-Ramirez and owned by the Fuller Family Dairy Groton Farm. Shortly after the initial collision, a vehicle being driven by 71-year-old Albert W. Perreault, who had also been traveling east, crashed into both vehicles. Members of McLean Fire Department among other responders arrived at the scene and extricated Ashley Williams from her vehicle as LifeNet was called to airlift her to Upstate Medical Center. Authorities stated that no other injuries were reported and that the cause may be related to speed and a glare from the sun, although the investigation is currently ongoing. Before moving on, we would, first and foremost, like to extend our sympathies to Jill R. Ashley Williams, as we maintain hope for her full recovery at this time. Following a New York car accident, it is very important to understand that victims often have significant rights moving forward, particularly in the event that you are not at fault for your injuries. At Hach & Rose, our New York accident attorneys have devoted their lives to helping the victims of reckless drivers and other negligent entities. We realize that immense physical, emotional, and financial burdens will frequently arise in the aftermath of a serious accident. If you have suffered injuries in a motor vehicle crash due to the actions of another party or entity such as a manufacturer, please don’t hesitate to call 212-779-0057 today.